Made by Laura Ashley, this decorative coffee table is constructed from solid rosewood and wrought iron. It has a plank top raised on trellis frieze and stylised wirework supports. Dating from the mid 20th century, this occasional table is carved from solid African hardwood. It has a chip carved rectangular top, raised on similar end supports united by a low stretcher. For sale a stunning Solid Rosewood Coffee Table designed by Johannes Andersen and produced by Silkeborg Møbelfabrik of Denmark, in the 1960s. The table has it’s Silkeborg maker’s badge present on the underside. Waxed to protect the furniture further. Solid Indian Dark Rosewood Rectangular Storage Coffee Table. Stained with a dark finish to protect the wood. This is a beautiful piece of dark solid wooden furniture finished to a high standard with a coating of dark wax to nourish and protect the wood. Waxed to protect the furniture further. Stained with a dark finish to protect the wood. 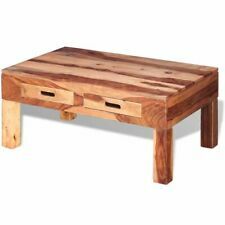 VidaXL Coffee Table Solid Sheesham Wood with Honey Finish 110x50x37 cm. This table is made of solid Sheesham wood and it can also be used as a side table or end table. Sheesham is a tropical hardwood that is famous for its rich grains and also known as rosewood or palisander. 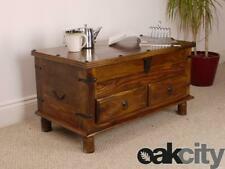 Solid 3 Drawer Coffee Table in Cube Petit Dark Sheesham RRP £269!! FREE DEL!! 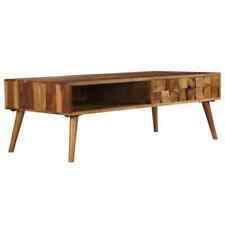 Cube Petit Solid Sheesham Rosewood 3 Drawer Coffee Table RRP £269! FREE DEL! A Stunning very heavy duty range made from solid Rosewood and Sheesham, this range has a rich dark finish which highlights the beautiful colours and grains of the wood. Hinged lid with lined storage interior. Beautiful glass topped occasional table. Lightweight and fits any room perfectly. Storage top length =16in. Storage top width = 12in. Storage top depth =5.5in. • 100% Indian Sheesham Wood. Living Room. Dining Room. VidaXL Coffee Table Solid Sheesham Wood. This sheesham coffee table is made of solid wood. Sheesham is a tropical hardwood that is famous for its rich grains and also known as rosewood or palisander. Stained with a dark finish to protect the wood. Solid Indian Rosewood (Sheesham) Large rectangular coffee table. No MDF, veneering or plastics are used in any of our furniture, just solid Indian Hardwoods. Solid Indian Rosewood (Sheesham) Large rectangular coffee table. No MDF, veneering or plastics are used in any of our furniture, just solid Indian Hardwoods. 80cm long, 60cm deep, 40cm high. Jali Solid Sheesham Rosewood Large Coffee Table, Listing is for 1 table 2ND! The Jali range from Classically Modern is hand crafted from the finest solid Sheesham (Rosewood) timbers where each piece is dry-kilned and treated prior to it’s production. Solid Sheesham is typically sourced from India, Nepal and Pakistan and is an incredibly hard wood with has a gorgeous chestnut colour. Cube Petit Solid Sheesham Rosewood Coffee Table with Shelf RRP £219!! FREE DEL!! FREE DEL! A Stunning very heavy duty range made from solid Rosewood and Sheesham, this range has a rich dark finish which highlights the beautiful colours and grains of the wood. It is at the driver’s discretion as to whether they take it any further. • 100% Indian Sheesham Wood. Living Room. Dining Room. Key Features • Natural Wood Finish. Industrial Inspired Pieces fusing Solid Wood and Cast Iron Design. Part of an ever expanding roster of Solid Mango Wood Furniture. • Features an appealing cast iron foundation. Living Room. Dining Room. Code: CL15. Zara Cube Sheesham. Vera Sheesham. Solid Sheesham Wood. Puna Range Acacia. Urban Acacia with Slate Inlay. Delhi Modula Acacia. More CategoriesRaja Mango Light Puna Range Acacia Accessories & Others Urban Acacia with Slate Inlay Vera Sheesham. Mid Century Vintage Norwegian Rosewood Coffee Table. UK Delivery Available. A beautiful rosewood veneer, mid century (1960s), long coffee table. Norwegian made by Heggen, the makers label is clearly visible underneath. The table features a high gloss finish with a deep tone. COLLECTION FROM THE ISLE OF WIGHT. DEPENDING ON LOCATION. IN GOOD CONDITION. 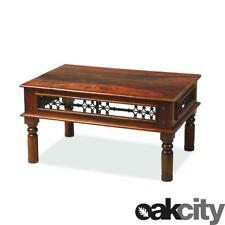 Jali Solid Sheesham Indian Rosewood 80 CM Wide Coffee Table. Craftsman Made, Solid Sheesham Rosewood Furniture from our Jali Collection. Solid Sheesham Indian Rosewood. Living Room. Dining Room. We are always happy to help with any queries you may have. Craftsman Made, Solid Sheesham Rosewood Furniture from our Jali Collection. Solid Sheesham Indian Rosewood. Living Room. Dining Room. We are always happy to help with any queries you may have. Mid Century Vintage Danish 1960s Cado Rosewood Coffee Table By Arne Vodder. A very smart mid century rosewood coffee table. Designed and produced by Arne Vodder for Cado in Denmark in the 1960s. With elegant legs tapering upwards into a circular top, which sit nicely in the rectangle shape of the table top. Code: CL34. Zara Cube Sheesham. Vera Sheesham. Solid Sheesham Wood. Puna Range Acacia. Urban Acacia with Slate Inlay. Delhi Modula Acacia. More CategoriesRaja Mango Light Puna Range Acacia Accessories & Others Urban Acacia with Slate Inlay Vera Sheesham. The coffee table JACARANDA (“palisander”) impresses with a design that is as minimalistic as elegant. The warm wooden tones and grain exude a cosy ambience. In combination with other wooden furniture, a warm and cosy atmosphere can be created easily. The dark tempered glass top impresses with its elegant marbling. Marble look: The dark tempered glass top impresses with its elegant marbling. Coffee Table with Glass Top. Marbleised Coffee Table. • 1x Coffee Table in Pieces. This table is made of solid Sheesham wood and it can also be used as a side table or end table. Sheesham is a tropical hardwood that is famous for its rich grains and also known as rosewood or palisander. I used the Indian Rose Wood top for another project and wondered if this item would be of use for any wood working project. Only accepted if not as described. Living Room. Industrial Inspired Pieces fusing Solid Wood and Cast Iron Design. Dining Room. Part of an ever expanding roster of Solid Mango Wood Furniture. • Features an appealing cast iron foundation.